Another reason to boycott Starbucks can be found on page 23 (in the link directly below) of the document from Goldman Sachs (Rothschild) – Taking a Deep Dive into Water – big profits for bankers set to privatize the water supplies in the United States, right now . .Starbucks is supporting the illusion of scarce water resources – just think a cup of Starbucks using recycled sewer water – a proven endocrine disputer causing cancer . . go to www.PrimaryWater.org to help spread the REAL water facts – Water is RENEWABLE . . . WE do not HAVE SCARCE WATER RESOURCES . . . BOYCOTT “GMO”s STARBUCKS – Neil Young Blasts Starbucks for Supporting Monsanto and GMOs in Rock Anthem – Song in the link below . . .
Young and the band The Promise of The Real debuted an acoustic version of the song, “A Rock Star Bucks A Coffee Shop,” in Maui, Hawaii at “OUTGROW Monsanto,” an event put on to call attention to Monsanto’s destructive practices in Hawaii. Hawaii is considered the global epicenter for GMO seed testing, according to Paul Towers of Pesticide Action Network. Corporations based around the globe test and grow GMO seeds in Hawaii, which can be grown year-round in the islands’ tropical climate, before shipping them to places like Iowa to sell to U.S. farmers and across the globe, according to Towers. Earlier this month, a jury awarded 15 residents $500,000 in damages for pesticide contamination from the biotech company DuPont-Pioneer. Young’s new song is part of his upcoming album “The Monsanto Years,” due out June 29. Young has been a food advocate for years. He’s the co-founder of Farm Aid, and when it came to light that Starbucks was supporting Monsanto in fighting Vermont’s GMO labeling law last fall, Young publicly declared he would be boycotting Starbucks. Starbucks says it has been wrongly accused of supporting the lawsuit, and the Grocery Manufacturers’ Association, which brought the lawsuit, has said neither Starbucks nor Monsanto is participating in the lawsuit, according to Reuters. Still, groups, such as GMO Inside, have been calling for Starbucks to cut ties with the Grocery Manufacturers’ Association, of which it’s an affiliate member (and thus a financial contributor), and to buy only GMO-free, organic milk. INSIDER COMMENT: DO NOT ALLOW those with money to seize our water resources by “Regional Incremental Consolidation” of our resources . . . The false water science of scarcity must be debunked. . We can NO longer remain ignorant and now must learn the REAL WATER SCIENCE . . . Primary Water is WHY we do not have a shortage of water. . . The Earth is the water planet and continuously creates water from within. . WATER is RENEWABLE – we are NOT running out of water. This is good news and must be spread far and wide . . . Think about what you will read below – California Water “REGULATORS” accepted an offer by farmers to make “voluntary” water cuts to avoid deep “mandatory” water restrictions. WHAT? You Better Volunteer or ELSE you will get deep mandatory water curtailments! Watch the YouTube “Water Wars – Stealing Water for Profit and Power” and take note of the Department of Interior’s Water Conflict Map – where the department anticipates guns battles over water theft from land owners – this is their map. !Please go to www.PrimaryWater.org and also watch the YouTube “Primary Water Explained”. SACRAMENTO, Calif. (AP) — California regulators have accepted a historic offer by farmers to make a 25 percent voluntary water cut to avoid deeper mandatory losses during the drought. Officials with the state Water Resources Control Board made the announcement on Friday involving farmers in the delta of the Sacramento and San Joaquin rivers who hold some of California’s strongest water rights. The several hundred farmers made the offer after state officials warned they were days away from ordering some of the first cuts in more than 30 years to the senior water rights holders. California water law is built around preserving the water claims of those rights holders. The threat of state cuts is a sign of the worsening impacts of the four-year drought. The state already has mandated 25 percent conservation by cities and towns and curtailed water deliveries to many farmers and communities. Farmers along the river delta at the heart of California agriculture expected to get an answer Friday on their surprise offer to give up a quarter of their water this year in exchange for being spared deeper mandatory cutbacks as California responds to the worsening drought. Regulators with the state Water Resources Control Board promised a decision on the proposal by a group of farmers along the delta of the Sacramento-San Joaquin rivers – a rare concession by holders of some of California’s strongest water rights. For the first time since a 1977 drought, California regulators are warning of coming curtailments for such senior water-rights holders whose claims date back a century or more. Earlier in the current drought, the state mandated 25 percent conservation by cities and towns and curtailed water deliveries to many farmers and communities with less solid claims to water. The most arid winter on record for the Sierra Nevada snowpack means there will be little runoff this summer to feed California’s rivers, reservoirs and irrigation canals. As of Thursday, the U.S. Drought Monitor rated 94 percent of California in severe drought or worse. About 350 farmers turned out Thursday at a farmers’ grange near Stockton to talk over the delta farmers’ bid to stave off deeper cuts. “That doesn’t necessarily mean they’ll all participate” in the proposed voluntary cutbacks, said Michael George, the state’s water master for the delta. But based on the farmers’ comments, George said, he believed many will. If the deal offered by farmers goes forward, delta farmers would have until June 1 to lay out how they will use 25 percent less water during what typically is a rain-free four months until September. The delta is the heart of the water system in California, with miles of rivers interlacing fecund farmland. It supplies water to 25 million California residents and vast regions of farmland that produces nearly half of the fruits, nuts and vegetables grown in the U.S.
Agriculture experts, however, say they would expect only modest immediate effects on food prices from any reduction in water to the senior water-rights holders. Other states will be able to make up the difference if California moves away from low-profit crops, economists say. State officials initially said they would also announce the first cuts of the four-year drought to senior rights holders on Friday. Water regulators said Thursday, however, that the announcement involving farmers and others in the watershed of the San Joaquin River would be delayed until at least next week. It is unclear whether the delta farmers’ offer would go far enough to save drying, warming waterways statewide. Farmers use 80 percent of all water taken from the land in California. Senior water-rights holders alone consume trillions of gallons of water a year. The state doesn’t know exactly how much they use because of unreliable data collection. The 1977 cutback order for senior rights holders applied only to dozens of people along a stretch of the Sacramento River. Although thousands of junior water rights holders have had their water curtailed this year, Gov. Jerry Brown has come under criticism for sparing farmers with senior water rights from mandatory cutbacks. Increasing amounts of the state’s irrigation water goes to specialty crops such as almonds, whose growers are expanding production despite the drought. Knickmeyer reported from San Francisco. Fenit Nirappil contributed to this story from Sacramento. 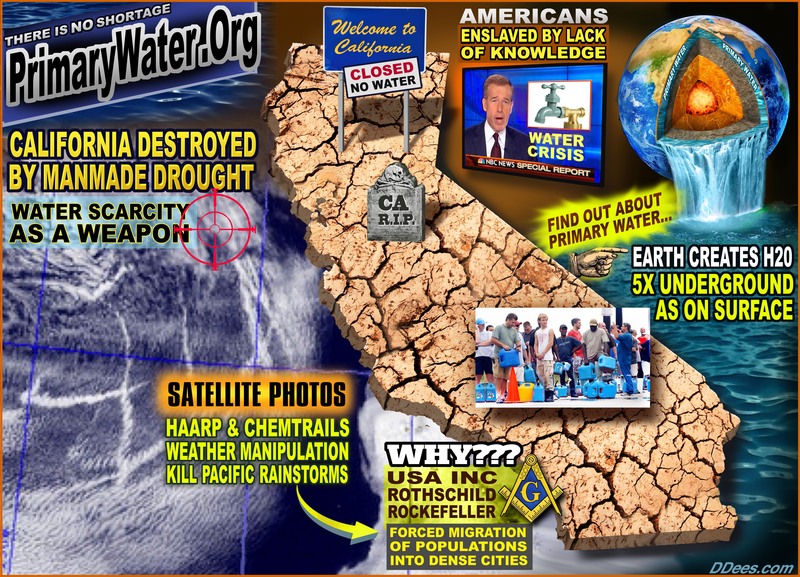 COMMENT: We will most likely witness more sabotage of our surface water supplies (secondary water cycle – toxic atmospheric water) as this deliberate engineered drought continues in California while the media ramps up on the hoax of water scarcity. . Remember, California is run by Rothschild/Rockefeller agencies and is waging war on public water resources in-order to privatize control, steal property, reduce the food supply and charge more for water . . . NASA recently told Californian’s they had only one year of water left. WHAT? Guess that’s now ten months of water remaining. So naturally we can expect the dumping of stored surface water and the reduced up stream flows of water that PG&E was just granted. (PG&E is Rothschild). Primary water is NEW water and has NEVER been exposed to the poisonous atmospheric pollution as the reservoirs, lakes and other surface water containments have been. The invented false science of water is serving political agendas. The REAL News is Water is renewable and is continually created within the mantel of the Earth. Watch the YouTube “Primary Water Explained” and go to www.PrimaryWater.org for the REAL water science . . .
50 Million Gallons Of Water Lost In Attack On Inflatable Dam, Worsening Drought Emergency For Alameda County « CBS San Francisco . .
Fremont police report vandals accessed a restricted area early Thursday, irreversibly damaging the barrier holding back the water which was supposed to go into the Niles Cone Groundwater Basin where residents and businesses in Newark, Union City, and Fremont could access the critically needed supplies. 81,000 customers are in that area. Instead, the water flowed into the San Francisco Bay. Police said the felony vandalism was an intentional act, but as of Friday afternoon had no suspects and were not exactly sure how it was damaged. The dam is in a restricted area, authorities said. 150 acre feet of water was lost. Generally, an “acre-foot”–the amount of water used to fill an acre of land up to one foot, is thought to supply a suburban family of four for a year. In the Bay Area, it can last much farther. 325,850 gallons make up one single acre foot. The water district handles water for 340,000 people in the southern part of the county. This entry was posted in Uncategorized on March 22, 2015 by ADMIN. This entry was posted in NEW POSTS, Uncategorized, WATER WARS on March 21, 2015 by ADMIN. PUBLIC COMMENT shut down when Primary water was brought up. PRIMARY WATER – The cycle: Will the primary water above the mantle cause environmental issues? WATER – Facts YOU Need to Know About Primary Water . . .
WATER LIES: A Guide for Private Domestic Well Owners . . . California State Water Resources “Control” Board . . .